From soothing your cough to flavoring your liqueurs, Mullein has a lot of uses, some of them you’ve never heard of. The seeds are cheap and they are easy to grow; simply put in a pot full of soil and water. And if you don’t want to grow Mullein, there are many sources for it online, most of them inexpensive. There are about 250 genuses of Mullein, which is a member of the Figwort family. Mullein is also called by about 30 common names including Velvet Dock, Candlewick Plant, Cow Lungwort, Hags Taper and Aaron’s Rod. These cultivars grow all over Europe, Asia and the Meditteranean. 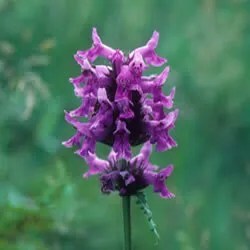 They are also widely cultivated in North America and can sometimes be found growing wild. Very common varieties include Moth Mullein, Dark Mullein, Wooly Mullein and Common Mullein. The cultivar I have used the most and whole heartedly recommend is Verbascum Thapsus or Common Mullein. This particular cultivar has been naturalized all over the US, mostly in Hawaii and also in Australia. So it can be grown almost anywhere. I highly recommend planting Mullein in your garden and using it year round. I have recipes and guidelines for you to use when making use of the plant so bookmark this page for after your plants are growing and blooming. You can use Mullein for many things during every stage of it’s growth so it is well worth the few cents it costs to buy a packet of seeds . Mullien was considered a magical herb in antiquity and it was given to Ulysses to protect him from the magic of Circe, who had changed his crew into pigs. The soft fine hairs on the leaves and stems of this plant makes a superb tinder and it was used this way throughout history. Hence, the popular name, Velvet Plant. These same soft hairs protect the herb from moisture loss, creeping insects and grazing animals because the down irritates mucus membranes. So this plant has few enemies in the garden, making it even easier to grow. So here are my hints on how to cultivate Mullein and how to use every part of the plant in every stage of it’s growth. I am sure you have heard of healing foot massage. In fact, it was a big craze a few years ago and people couldn’t keep foot massagers in stock. But what many people discovered was that general foot massage, with no goals in mind, is only good for relieving foot pain or general foot exhaustion after being on the feet all day but it did nothing for general well being. But this is only because a general foot massager won’t do the trick. You have to know what parts of the feet directly influence which parts of the body in order for food massage to help with healing your body. Also, you can find out where your body is in trouble with foot pressure and I will show you how to do this, too. It’s all really the same thing. If you know what’s wrong with you.. ie, you have a headache, then you can go to a certain portion of the foot, massage it and get releif for your headache. Conversely, if you don’t have any idea why you feel like crap, you can feel around your foot, applying pressure and rubbing gently, until you uncover the area that gives you grief. That area will directly relate to a part of the body and it is this part of the body that is in need of help. Sound hard? Sound complicated? It’s not! I will show you with diagrams and written directions how to do all of this just by rubbing your feet. This type of massage is called reflexology. However, I do not have training in these methods so I am just passing on what I have experienced through my own massage therapy. I will not claim this to be “reflexology” but sort of my own map of the areas on the foot that will help relieve physical pain and discomfort. Now, I will include maps of the feet to show you where to find the area on your foot. Also, conversely, I will show you which area of the body is indicated by pain or discomfort in your feet. But do not consider these maps to be related to reflexology or to have any connection to that practice. These are not reflexology maps. In this method, which is not relexology, you will also use essential oils in a base massage oil while you do it. You will use the oils whenever you massage, although massage without the oils won’t do any harm. The technique is just far more productive with the oils. I will give you the recipes for the oils you will use on each part of the foot and you should follow them exactly and not improvise. It’s far better to do without than to work with only a part of a recipe or an improvisation that may not only be ineffective but could be harmful. So follow instructions. I want you to begin the process by sitting down when you have the time and won’t be interrupted. After you get good at it, you can massage your feet on a quick break at work but at first you should have quiet time to concentrate. Start by washing your feet so you won’t be distracted by any smells or end up rubbing glass or stones into your feet. Your feet pick up all sorts of stuff even when you have shoes on so be mindful of that. After washing and drying your feet, sit down and start rubbing the bottom of the foot. You can start anywhere, just be sure to rub every part of the foot, moving from area to area and paying attention to how it feels as you do it. There will be really sensitive areas, areas that cause pain or discomfort and areas that feel so good you might even get ecstatic. Pay attention to what areas on your foot create each sensation. Be especially mindful of strong physical responses, even good ones. If there is repulsion or irritation when rubbing a certain area, please be mindful of this as well. You do not have to continue massaging that area right now but you should be aware that this area will be cause for concern. So start rubbing your feet, moving from area to area, from the toes to the heel, and pay attention to the responses your body gives you. And then move on to the instructions and charts I am providing you in order to start the healing process. As winter fades and spring arrives, we want to get out and get active. We just feel like having fun and playing games outdoors. Walking, gardening, fishing, swimming, water skiing, whatever your poison, you need to need to get rid of your pain so you can start doing it. Arthritis gets bad in the winter, but it doesn’t matter as much as it does the rest of the year. We are indoors, sitting or just doing easy things around the house, going to bed early, sometimes sleeping late. We just aren’t as active so treating the pain is easier. You can tolerate more stiffness, too. But how do you handle the pain and stiffness? How long can you take NSAIDs without upsetting your system and getting sick to your stomach? Do you switch to Tylenol whent the stomach pain starts? And then you have to be careful about how much and how often or risk hurting your liver. There is no easy solution. It seems like everything you can take for pain has a big price tag. Stomach ulcers, liver failure or addiction to stronger relief like Oxycodone or Codeine. Way too much to worry about when you’re just trying to get moving again and everything hurts. This is an issue dear to my heart because I have this condition. It started with me when I was 11 years old, just after I entered puberty. I started menstruating early and I had a hormonal imbalance right away, with overly enlarged breasts and a startling gain in weight. But I was not, at first, hypothyroid. In fact, treatment with thyroid hormones made me violently ill, complete with seizures and foaming at the mouth. The subsequent rush from doctor to doctor eventually revealed the truth: I had Graves Disease. I had this condition from that moment on and am still considered suffering from it, but in remission. This remission was acheived by destroying my thyroid gland with drugs and forcing it into failure. So today I am dependant on synthetic thyroid for the rest of my life. Right off the bat, let me say that I would never advocate not taking your thyroid meds. Whatever they are, do not stop, even if you consider trying other therapies. I have made the unfortunate mistake of stopping mine and I can tell you that myxedema, the result of this stupidity, is not an experience you will relish. It takes forever to lose the edema, the puffiness that results but that is the small of it. The loss of hair is substantial and the weight gain is tragic. I was pulling my hair out in handfuls and since then it has never been the same. So DO NOT ever stop taking your meds, not even because of lack of funds.. I would stop buying food or paying for the car before I’d give up my medication. And you should do the same. But what I do want to suggest or advocate is to experiment with different therapies that might aid your gland, support your immune system and/or lessen the symptoms to some degree. No matter how much thyroid you take (I take the highest dosage available), whether you are only slightly hypothyroid or if you are like me, at the outer limits, you can benefit to some degree by using alternative therapies and supplements. I do not advocate taking thryoid drugs if you do not have a thyroid condition. The urban legend that I keep hearing is that they will make you lose weight and make you feel peppy. For one thing, they take two weeks to get into your system so if you’re willing to wait that long just to feel peppy then that might be the result but it won’t be like you imagine it to be, it isn’t like cocaine or meth. And, on the issue of being a weight control medication, I can debunk that. It is just as hard for me to lose a pound on the pills as it is off of them. They do not make that much difference, even for those who are diagnosed with the disease. They just don’t raise your metabolism anymore than thyroid by itself does this for your body when you’re healthy. Metabolism is created by a large number of various organs and hormones combined in your body. If you’re healthy, just say Thank God! and enjoy it. For those of you who are dragging around, feeling the exhaustion that so many thyroid sufferers feel, there are treatments you might want to think about. The objective of any supplemental treatment is to improve all sysmptoms, prevent and treat later complications, correct imbalance, adjust the immune system and most importantly to boost energy and strengthen the body for better health and quality of life. The following herbs have been shown to have some effect on hypothyroidism and can be used in combination with the presciption medication. The most important thing in performing excellent aromatherapy massage is the choice of oil. As well, the quality of the oil is of utmost importance to the experience and the results. It is the inherent healing properties in herbs that lend the oils their magic and the scents that they impart have everything to do with how well someone feels afterwards. If you use a lousy oil or an impure oil the effects can be dramatically poor. In fact, you might even make someone feel worse if you massage them with a rancid or ineffective oil. So always be careful in the choosing and using of your oils and whenever possible make your own and use it fresh. Although this blog is too small a format to go into the ins and outs of physical massage, such as where to rub or how hard, which is tantamount to technique. This is what is taught to those who choose to attend school for massage therapy and get a certificate for their trouble. It is extensive and involved, with lessons in biology and muscular anatomy as well as a metaphysical look at which area is affected by what oil or herb. If you wish to become a massage therapist there are many reputable schools that can teach you this trade but it isn’t going to be easy and it isn’t going to be free. However, here, in this format, I can teach you about the oils and how to make your own effective oils for the private massages you choose to perform on those special people in your life. Are Sunscreens Effective or Dangerous? Sunscreens have a history of being greatly desired, on the one hand, and generally feared, on the other. This is because everyone has become convinced that sun exposure causes skin cancer and sunscreens are the only remedy for this while, at the same time, coming to the realization that sunscreens are made up of unnatural chemicals and additives that are suspected of toxicity. Very few of us remember this, but the very first sunscreen made for public use was made up of red vetinary petrolatum (yes, I said vetinary) and it was just a horrible, sticky goop that wasn’t proven to do much of anything. And, yet, it was the only product offered at the time. In contrast, today we have more than 500 choices for sunscreen, mostly because people have become terrified of sun exposure and this has carved out a an enormous wallet in the market. But regardless of the fact that we have come to believe that sun exposure causes skin cancer and sun screens are somehow a miraculous barrier to that exposure, and thereby desired and, in some cases necessary, tools in the summer safety kit, the only thing that sunscreens are truly proven to do is prevent sunburn. In fact, according to the FDA’s 2007 draft sunscreen safety regulations, the “FDA is not aware of data demonstrating that sunscreen use alone helps prevent skin cancer.” The International Agency for Research on Cancer (IARC) agrees with this and, in fact, they recommend clothing, hats and shade as primary barriers to UV radiation. Their materials also say that “sunscreens should not be the first choice for skin cancer prevention and should not be used as the sole agent for protection against the sun. In other words, there is NO PROOF that sunscreen prevents skin cancer.